In a continued push to position iPad Pro as a full-fledged laptop replacement, Apple on Monday released a short TV ad touting the tablet's benefits over traditional portable machines. Titled "What's a computer," Monday's 30-second spot offers a brief rundown of iPad Pro highlights, including a stow-able keyboard, multi-touch display and handwriting input via Apple Pencil. 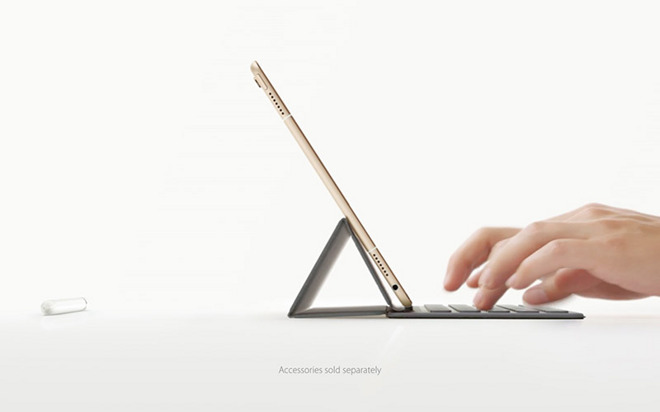 The result, Apple argues, is a much more flexible platform than rigid keyboard-and-screen designs. "Just when you think you know what a computer is, you see a keyboard that can just get out of the way, and a screen you can touch and even write on," a narrator says. "When you see a computer that can do all that, it might just make you wonder, 'Hey, what else can it do?'" Apple is working hard to create a narrative for iPad Pro, one that positions the tablet as part workstation, part play station. Historically, tablets are viewed as mere content consumption devices, as they lack the hardware and software assets required to run professional applications. As seen in today's advertisement, which showcases the 9.7-inch iPad Pro, Apple believes its latest tablet solution can be a viable work machine. Aside from advanced hardware technology like Apple Pencil and a built-in touchscreen, iPad Pro is made more capable through unique software integrations found in iOS 9. For example, the latest iPads Pro can handle quick multitasking, two-up Slide Over app views and even picture-in-picture video. AppleInsider found the most recent 9.7-inch iPad Pro release a worthy successor to the iPad Air 2, noting new hardware like Smart Connector and Apple Pencil open the door to professional grade applications. in it current iteration, however, power users looking for a true laptop replacement might find the iOS ecosystem a bit wanting.